Today it is my stop on the Blog Tour for One Last Summer at Hideaway Bay by Zoe Cook. I have an amazing Q&A with Zoe for you to read, but first let me share with you how gorgeous the cover is and what the book is about. How are you? It’s been a while. I’ve been meaning to get in touch but it’s hard to know how to after so much time. I hear you’re doing really well up there. I knew you would be. Awwww, doesn't that sound really beautiful? And intriguing! Sounds like it could have the potential to be a bit of a weepy, so i'm going to make sure I have the tissues to hand - just in case. Right, well, I can't contain my excitement any longer, so let's go and meet up with Zoe and have a chat! Work as a TV producer on Richard & Judy’s Book Club on Channel 4 involved selecting the books for their lists, and each year we had to choose eight summer reads. These were the books that we thought people should take away on holiday, or could at least read on the tube and imagine they were away on holiday – and I fell in love with these sunny, fun, fast-paced stories. I had an idea for a love story set in Cornwall for a long time before I managed to actually start writing anything, and the final push for me to get typing was actually meeting the legendary and much missed Jackie Collins for an interview for The TV Book Club in Beverly Hills. Her enthusiasm, passion for writing, her inimitable writing style, and her absolutely fabulous presence when we met really inspired me to finally start writing my own book. Who did you write One Last Summer at Hideaway Bay for? I think I wrote this book for a younger me. I grew up on a (probably rather unhealthy) diet of Dawson’s Creek, The OC and Disney films – it’s really no wonder my ideas about romance were so out of kilter with reality. I’ve always loved escapist, aspirational stories. I love delving into new places with characters you grow to love. Most of all, I’m really interested in those formative years in your twenties when you’re chucked out into the world after education and finally have to figure out who you want to be, and how to do it. I wanted to write a book that brought together an amazing location, Cornwall, with a coming of age drama, all set across one, unforgettable, summer. What do you hope readers will take from One Last Summer at Hideaway Bay? All I really want is for readers to enjoy the story. If they happen to want to book a holiday to Cornwall at the end of the book then I’ll consider that a job well done. I grew up in Cornwall and it’s one of my favourite places in the world. I wanted to set a book there partly so I could imagine myself there for hours at a time while writing, so I really hope I’ve captured even just a little of it’s very special beauty in the book. I also hope that readers get a little swept away in the romance of the book, it’s the kind of love story I grew up wishing would happen to me! Do you almost view Cornwall as a character in the book? As well as being a beautiful place, for me Cornwall in the book represents the ‘home’ we all have to leave behind – whether physically or metaphorically, at some point in life when we are forced to grow up. For Lucy at the start of the book, home has become somewhere to forget, and to move on from. But as the story progresses and she’s drawn back there she realises that you can’t ever really escape who you truly are, and part of that is built on where you come from. In that sense, I hope Cornwall adds a bit more than just sand and waves to the book, for me it is definitely a defining part of the story. The book begins in London, in a very different world to Cornwall, did you enjoy being able to write about a city too? I’ve lived and worked in London since leaving university and I love it. I also think the contrast between Lucy’s two worlds in the book help us to see how torn and tormented she is. A bit like Lucy, I think while there’ll always be a part of my heart that belongs to Cornwall, London has claimed its own piece now too, so it was great to be able to write a bit of London into the story at the beginning. Do you see more stories set in Hideaway bay? 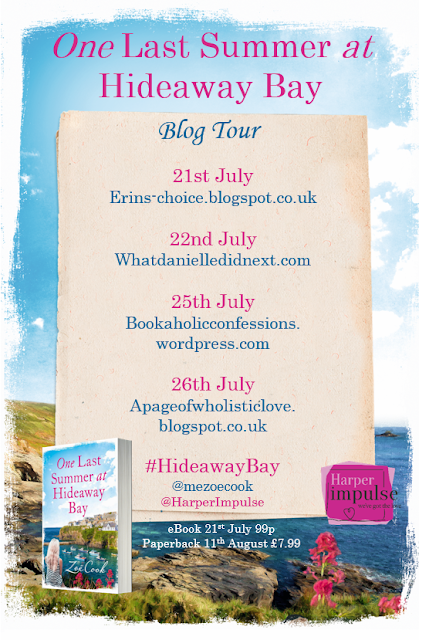 I’d definitely like to return to Hideaway Bay, and there’s plenty more drama waiting there I think! Ok, so, i'll let you catch your breath there whilst I share with you the rest of the stops on the tour, take some time and head over to the blogs and see what's lined up there. And be sure to come back soon, for more reviews and exclusives!